Art Speaks is the Epoch Times’ global art exploration project. Here we explore works of art created before 1900 from all parts of the world – Americas, Europe, Asia, Africa, Oceania – and in all mediums whether they be decorative or fine. Anyone who has insight to share is welcome to participate. To pitch an idea, first submit a photograph of the artwork you wish to write about via http://tiny.cc/arttalks. If approved, an editor will contact you to begin the writing process. The Ship of Fools is amongst the Louvre’s most delicate and piercingly luminous images, its motley crew stitched together with inspired invention and impeccable craft to elucidate a timeless moral question. Painted by Hieronymus Bosch around 1500, The Ship of Fools was presumably inspired after Sebastien Brant’s book of satirical poems of the same title, published in 1494 (of note is that each poem, 112 in all, was illustrated by a woodcut, many having been carved by Dürer). Alone, his crooked back to the mob, he remains impervious to the wafting, insidious echoes of gluttony and drunkenness as he stares, stares into his bowl, wondering what he missed. The Flemish printer and humanist Josse Bade van Asche supplemented the Brandtian fleet of mostly male fools with his own illustrated text of a Large Ship of Female Fools, a text also conceived of having influenced Bosch. The Louvre’s picture is a fragment of the upper left wing of a triptych. The other existing side panels are Allegory of Gluttony and Lust (Yale University Art Gallery), Death and the Miser (The National Gallery in Washington D.C.) and The Wayfarer (Rotterdam). The central panel is lost. In the picture, a ship of fools is adrift on a calm sea, a slender tree taking place of a mast, an owl or death mast half hidden amongst its foliage. 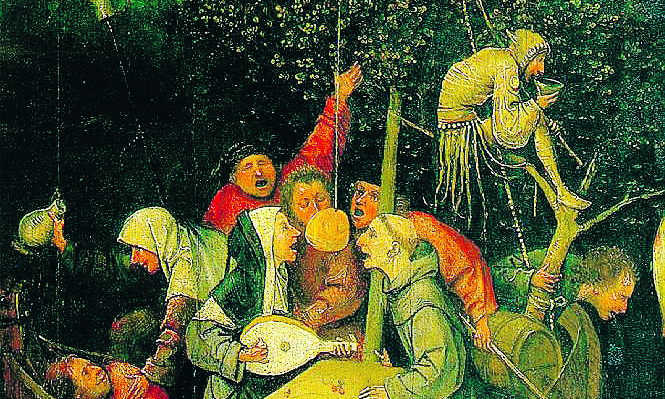 The principal group of figures centres around a table over which preside a monk and a nun, busy either singing or trying to eat a suspended crêpe without their hands, an activity made more difficult by the agitation of the line by a fellow reveller. Two oarsman have ceded their navigational task to participate in the game, a woman strikes a prostrate drinker, a man reaches to cut loose a roasted goose, a swimmer beckons for more, a man vomits. The antics of this recklessly bemused human cargo propel a straightforward allusion to the vain pursuit of excessive eating and drinking as a means to either evade life’s more refined cultural offerings or, more probably, to forget the punishing ordeal of daily life itself. Of more elusive meaning, perhaps, are the two remaining figures. 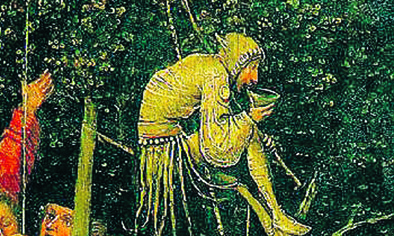 A small figure, the only indeed dressed as a Fool, perches in a tree, facing away from the others and introspectively sipping out of a bowl. Another figure, a swimmer, rises up out of the water, either gingerly trying to participate in the party, or rather trying to direct or guide the craft itself, albeit gently. Bosch parades this wondrous diversity of highly articulated forms in a finely tuned orchestration that centres around the suspended crêpe. Each shape is a delight to the eye, each contour seemingly refined to perfection, and the subsequent interplay between positive and negative space becomes a puzzle of seemingly divine design. And yet a mere pictorial puzzle this great picture is not. As Glenn Gould explained in one of his Canadian Broadcast presentations, anyone can write a fugue. But there is an esoteric perfection to the poetics of a fugue written by Bach that remains without equal. Bosch first elevates his picture onto this higher plateau of art by inserting a convincing yet almost unnoticeable moment of magic. That fine moment sounds when the crêpe is set in motion by the delicate plucking by a tiny hand. This outrageously subtle visual note is, however, plucked with enough force to tip the main vertical axis of the tree and consequently reverberates throughout the entire motley company. Every shape tips and shifts, activating an adjoining shape to create a rich pictorial fugue (most probably in a minor key) and the tight gearing of the composition is deliciously palpable as the Ship is set in motion. The rowdy occupants are adrift upon the unforgiving sea of their desperate lives, their abandonment of both oars and moral purpose complete and remorseless. The exception is the Fool himself. Born and raised in Michigan, the son of two artists, Thaddeus Radell completed his B.F.A. at University of Detroit/Mercy before moving to New York City to study at Parsons School of Design. Soon after receiving his M.F.A. in 1982, Radell left NY and moved to France, where he spent the next fourteen years, teaching and painting, dividing his time between his studios in Provence and Paris. Returning to New York City in 2000, he now exhibits regularly in the city and teaches at The Borough of Manhattan Community College and Parsons School of Design.